David H. McGalliard, 92, of Cheshire, passed away peacefully on March 20, 2019 at his residence. He was born in Newark, NJ on February 17, 1927. He lived in New Jersey for twenty-one years and graduated from Millburn High School in 1944. He served in the U.S. Navy for eighteen months, after which he enrolled in Rutgers University. In 1948 he married Jane Simmons, the girl next door, and then finished his senior year at Rutgers while living in an on-campus trailer. After receiving his B.S. in electrical engineering he worked for Electric Controller & Mfg. in Cleveland. Before he started the job, however, he and Jane took a six-week cross country trip in their 1934 Ford, Boj (“Job” spelled backwards), hauling a homemade trailer behind them. During their seven years in Cleveland, their twins, Bruce and Lesley, were born, and three years later another daughter, Robin, arrived. David earned an M.B.A. from Case Western Reserve. He then took a job with with Sperry Rand in Minneapolis for three years, during which time Nancy and Lynn were born. While in Minneapolis, Jane’s cousin, Marjorie Phelan, passed away, and after some struggle, her husband, Robert, was not able to care for the three children alone. Dave and Jane chose to become the legal guardians for David, Louise, and Susan, which suddenly brought the number of children to eight. In 1952, they were transferred to New York, and lived in Mountain Lakes, NJ. With a friend, Dave remodeled a large house to accommodate their sizeable family. In 1966, the family moved to North Haven, CT where Dave worked for Phelps Dodge and Controlex. In 1980, Dave bought Glyne Mfg. Co. and served as president until his retirement in 2001, when Bruce took over the company. In 1987, after 38 wonderful years together, Jane died. In 1989, Dave married Patricia Goldman, whom he had known for twenty years through social contacts. He and Pat were married for thirty happy years, during which time they enjoyed biking in Austria, France and the Netherlands, as well as traveling in the U.S. and other European countries. 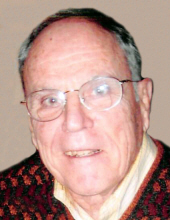 Throughout his life, Dave enjoyed many pursuits -- tennis, golf, skiing, acting in plays put on by the High Lane Club or Spring Glen Congregational Church where he was an active member and deacon. He loved music; he played piano, sang in the car on road trips, and was an avid fan of musicals. He was a graceful dancer and fun to watch on the dance floor. He was an adventurous spirit in his 50’s, earning his pilot’s license and acquiring a Cessna 152 as well as a scuba diving certification. The Northern New England School of Religious Education (NNESRE/”Winni”) held a special place in Dave’s heart. The family spent many happy weeks on Lake Winnipesaukee at Geneva Point Center in New Hampshire, and Dave also served on NNESRE’s board. Dave is remembered with love by his wife, Patricia Valentine Goldman McGalliard, five children and their spouses, Bruce (Emily), Lesley (Rich Layman), Robin Nelson (Eric), Nancy Brattain (David), Lynn Arnone (Jay), eight grandchildren and three great-grandchildren, his three guardian children, David Phelan, Louise Barber and Susan Baxter (David) and their children and grandchildren, as well as his stepchildren Nancy Papa (Kenneth), Edward Goldman (Jennifer), Susan Nisson (Michael), and their children and grandchildren. Even though the siblings live all over the country they are in close contact, and gather regularly for family reunions. Friends are invited to join Dave’s family for a memorial service to celebrate his life on Monday, March 25th at 2:00 p.m. in Nelson Hall at Elim Park, 150 Cook Hill Road, Cheshire. Burial will be private. Contributions in Dave’s memory may be sent to the Elim Park Residents’ Benevolent Fund, c/o Barry Tomlinson, 140 Cook Hill Rd., Cheshire CT 06410. BEECHER & BENNETT, 2300 Whitney Ave., Hamden, in care of arrangements. To send flowers or a remembrance gift to the family of David H. McGalliard, please visit our Tribute Store. c/o Development Office, 140 Cook Hill Rd. "Email Address" would like to share the life celebration of David H. McGalliard. Click on the "link" to go to share a favorite memory or leave a condolence message for the family.